Judging by all the photos and text alerts I've received over the past few days, there is quite definitely an element of movement in the air. Even as early as February, it is possible to detect the very first signs of spring's movements. Perhaps the first signs are increased vocal activity from wintering birds; my local Northern Cardinals are certainly getting vocal now and, while I was attending to our noticeboard at The Meadows at the weekend, it was easy to hear the male Red-winged Blackbirds singing "Congaree" from the cattail stems - though it will be a good month yet before the females start showing an interest in them! Just yesterday, I was giving my meadow its once-a-year haircut and a Field Sparrow was putting its vocal chords through its paces too. Other signs include increased flocking behavior by wintering birds. Small parties of up to half a dozen Killdeers are not uncommon around Cape May over the winter, but on Sunday, I counted 32 of them in the back field at The Beanery. A sure sign that they are thinking of moving soon - this is a species that can be hatching young by late March in our area. The male King Eider seems to have taken the first step toward shipping out too, having recently moved from the Ferry Terminal area to the Cold Spring Jetty by the Coast Guard Unit. Unfortunately this means he is currently pretty much off limits to us mere mortals who don't have a Coast Guard pass, but maybe he'll move somewhere more accessible soon. Other increased flocking behavior I have witnessed lately includes a build up of Greater Scaup off beaches in the Villas (probably just drifting down river from wintering grounds further up the bay) and a build up of Bonaparte's Gulls on the Villas beaches. Associated with this latter event, perhaps, was the second Black-headed Gull that I discovered there on Sunday morning - shortly afterward, Tom Magarian reported two together. This newly-arrived bird has more dark on its head than the original, long-stayer, due to being a little more advanced in its spring molt. Slow northward drift accounts for some other movements at this time of year, especially with ducks and gulls. 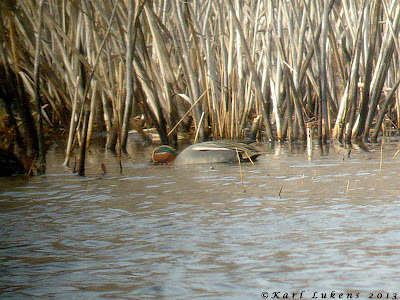 A build-up of Green-winged Teal at Cape May Point State Park over this past week resulted in the discovery of a male Eurasian Teal on Lighthouse Pond on Monday, while a male Blue-winged Teal with them was perhaps one of the two that has been wintering with us this year. Also in the category of slow northward drift comes an Osprey, reported from the state park on 25th and an early Piping Plover, reported by Tom Reed on South Cape May Beach this very morning (27th). Even now, structuring this post is tricky since reports are coming in as I type! Tom also just reported five American Oystercatchers, seven Northern Pintail and three Great Blue Herons, all heading north at the point this morning. Despite all this movement, some long-stayers also remain, while other birds are clearly just winter wanderers - such as the Red Phalarope seen flying over Bunker Pond by Doug Gochfeld on 23rd. Other wintering birds still around include a party of Red Crossbills in the Cape May Point dunes (10 were also seen flying north in Del Haven on 23rd and one or two have been noted on and off at Cox Hall Creek WMA), a juvenile Golden Eagle and male Eurasian Wigeon at Corbin City Impoundments (a Short-eared Owl was also at Corbin City at the weekend), a Tricolored Heron in the Two Mile Landing area and at least one Orange-crowned Warbler still at the state park. Sam Galick reported another Golden Eagle in Belleplain State Forest on 24th - nice reward for going 'off piste' and checking some different areas. Finally, on 24th, a Lark Sparrow was found with a flock of Dark-eyed Juncos on Millman Lane in Villas by Vicky, Richard and Hannah Smith. Other signs of spring include a few Red Maple trees starting to break into flower, while I heard my first Spring Peeper of the year on Sunday. Male Eurasian Teal on Lighthouse Pond on Monday. Note that the white stripe goes horizontally on this bird, not vertically like Green-winged Teal. Many taxonomic committees recognize this taxon as a separate species, but the American Ornithologists' Union remains to be convinced [photo by Karl Lukens]. Lark Sparrow on Millman Lane in Villas, February 24th [photo courtesy of Vicky Smith]. The Crested Caracara connundrum continues - the Atlantic County bird has disappeared, but now there is one back in Salem, after a lack of sightings for a while. Is there really only one bird then?! This bird was photographed along the Kings Highway near Sharptown, Salem County on 24th [photo by Jeff White]. Duck movements are worth studying now as numbers build up prior to heading north. This up close shot of a male Red-breasted Merganser was taken by Beth Polvino at Avalon recently. Keep an eye on Snow Goose flocks for something different among the white masses. This family of two adult and four first-winter blue morph Snow Geese was reported by Sam Galick at The Rea Farm on Stevens and Bayshore in West Cape May this morning. This dark color form of Snow Goose is uncommon but regular at Cape May, though a whole family is unusual. Note the clean white head and bright pink bill and legs of the adults, while the youngsters have mottled heads and pinkish gray bill and legs [photo by Mike Crewe]. The adult Black-headed Gull, seen here with two Ring-billed Gulls, continues to hang out on the beach at the north end of Villas. A falling tide soon after high tide seems to be the best time to look for it. 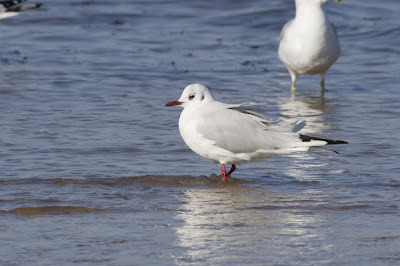 The wing pattern closely resembles that of Bonaparte's Gull, but look for the red bill and legs and slightly paler back [photo by Mike Crewe]. If you're looking for the Black-headed Gull, be sure to enjoy the shorebird spectacle also taking place along the bayshore now. Close views of Black-bellied Plovers give good opportunities to spot the black 'armpits' of these chunky birds [photo by Mike Crewe]. The highest tides of the month, associated with the full and new moons, are the best time to check the saltmarshes for wintering marsh sparrows. The next high tides are due early next week so it's a good time to scan along the edges an hour either side of forecast high tides for these ace skulkers. This Nelson's Sparrow was at Jake's Landing Road recently - look out for Saltmarsh and Seaside Sparrows too, as well as Clapper Rails [photo by Mike Crewe]. If you are walking around urban areas, keep an eye out for flocks of Cedar Waxwings polishing off the last of the season's berries. Watching them can be a lot of fun as they turn acrobatics to get at the last little fruits, dangling on the ends of the thinnest branches. This one is tucking into privet berries at the Pavilion Circle in Cape May Point [photo by Mike Crewe]. Cox Hall Creek WMA is always a great place to bird during the winter, when a nice mix of sparrows, blackbirds, finches, bluebirds and other birds can be found and enjoyed. This first-winter Red-headed Woodpecker was still present a couple of days ago at least, having spent the winter stashing food in dead tree trunks. Looks as though that red head is just starting to creep in now [photo by Mike Crewe]. Having had a tricky knee issue lately, I've been getting ever more desperate for birds that can be viewed without a walk! Suffice to say that I had pretty much run out of new things to watch at Cape May so, under heavy disguise, I ventured out of the county and up as far as New Egypt in Ocean County to see the three Northern Lapwings that have been present for some time there now. This is a very common bird where I come from, but still a great one to see and well worth the visit if you have not already done so. The birds are wintering with Longhorn Cattle on Brynmore Road, about a mile and a half south-east of New Egypt [photo by Mike Crewe]. Last but by no means least, don't forget that our Friday evening walks at The Meadows start today at 4:30PM. Do come and enjoy some great birding, but while you are there, also notice the great work that has been carried out to maintain the trails and habitats. The main trails have all been elevated slightly and re-graded after the effects of Hurricane Sandy, while the Plover Ponds (seen above) have had a lot of encroaching vegetation removed. While removing plants on a nature reserve may seem odd, we have to remember that wildlife habitats need to be managed, or they will all end up looking the same and the wildlife that requires special conditions will lose out. These ponds need to be kept open to maintain their value as post-breeding feeding areas for Piping Plovers, so invasive, non-native willow and poplar seedlings have been grubbed out and the pond margins re-graded [photo by Mike Crewe]. You have to be careful when you're writing a blog on the world-wide web, for you never know who is reading! 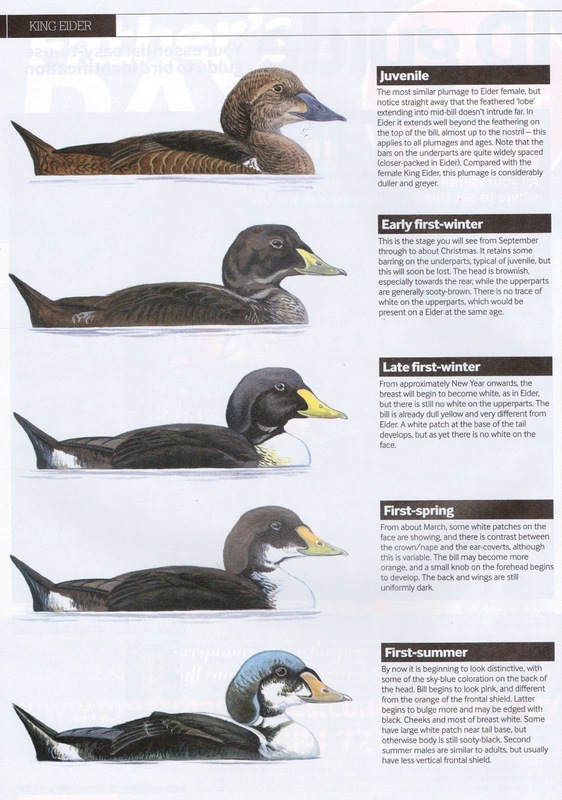 Back on February 7th, I wrote a post about the immature King Eider that is currently wintering with us at Cape May and I commented on how I had been unable - from a quick scout round - to find a field guide that illustrated the plumage that the bird was currently in. This was not a comment on field guides, for illustrating every possible plumage would make for a pretty hefty tome. It was more a comment on just how hard it can be to identify a bird sometimes. Well, Dave Nurney, a British birdwatcher who is well-known on the other side of the Herring Pond for his illustrations in bird books and magazines, recently emailed me to tell me that he had noticed the same problem in the UK, and had been addressing this through a series of identification articles that he had been working on with Dominic Couzens in Birdwatching Magazine (this being the UK publication, not the US one). These articles have led to a book which is due for publication this coming spring, called I.D. Insights: Identifying the more difficult birds of Britain & Europe. Dave's illustrations aim to cover more of those 'half way' plumages that many species go through as they gradually progress from juvenile to adult and below is the plate that he painted for one of the original magazine articles. Male King Eider plumages during the first 12 months of life. 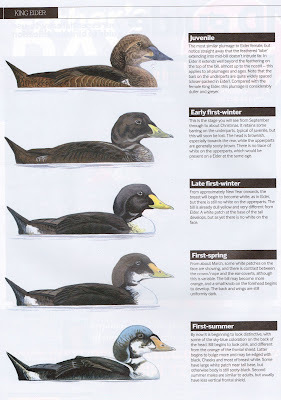 Cape May's King Eider currently looks pretty much like the 'first-spring' illustration shown here; if he stays for a few more months, look for the bluish color starting to come on the head. Above illustration © 2012 Birdwatching Magazine/Dave Nurney. If you are out and about over the next few days, keep an eye out for the male King Eider, who has recently been residing at the west end of the Cape May Canal, usually around the stone jetty at the mouth of the canal on the Higbee Beach side, though viewable from either side of the canal. A Common Eider has been present there too. A second King Eider has been reported from the coastguard base, again with Common Eiders. Along the bayshore, the Black-headed Gull continues and is most reliably seen from the sand bar off the west end of Miami Avenue in Villas. There's a good gathering of birds here most of the time and good viewing appears to be best shortly after high tide, as the water starts to pull back. Other birds here include plenty of Forster's Terns and good numbers of shorebirds, including Black-bellied Plover and occasional Red Knot. At nearby Cox Hall Creek WMA, Don Freiday recently reported an Eastern Phoebe and the same site remains a good spot for a great mix of sparrows, finches and an assortment of other birds, including Rusty Blackbirds. If you can tackle the walk, a Golden Eagle continues to be reported periodically from Tuckahoe WMA (the banks are still undriveable after Hurricane Sandy damage, but you can walk in) and, even further afield, a Lesser Black-backed Gull was a nice find on 15th at Maple Avenue, Dividing Creek, Cumberland County. Keeping us abreast of what is happening further offshore than us landlubbers usually venture, Tom Johnson's research work is currently turning up good numbers of auks out there. Tom's sightings on 12th included a Black-legged Kittiwake, Common Murre, Atlantic Puffin and 487 Dovekies. 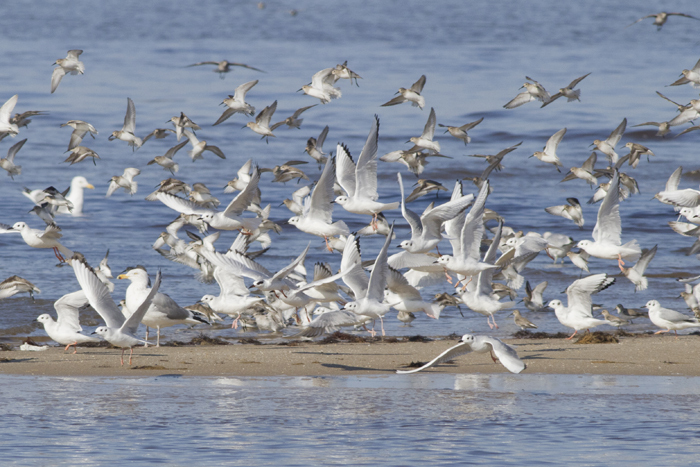 A wonderful melange of gulls, terns and shorebirds await you at Miami Beach in Villas [photo by Sam Galick]. Adult winter Black-headed Gull at Miami Beach [photo by Sam Galick]. 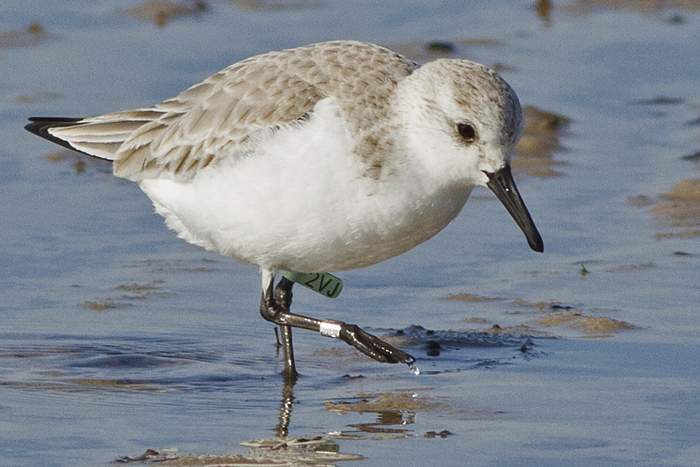 While you are at the beach, keep an eye out for banded or otherwise-marked birds. Such research projects rely heavily on citizen science to get sightings of marked birds, and this information can provide vital data on bird movements. This Sanderling wears a typical leg flag on the upper part of its left leg - the color of the flag and the alphanumeric code should be reported; here it is 2VJ on a light green flag. You can send all your sightings in via the USGS website [photo by Sam Galick]. Visit any of the ponds in our area right now and chances are you will see a scattering of ducks; there's also a pretty high chance that among them will be Northern Shovelers. While most ducks can be easily divided into those that dive for their food and those that 'up-end', the shovelers have another trick up their sleeve to ensure that they make best use of the feeding opportunities offered to them and it's all down to that eponymous, shovel-like beak. If you watch Northern Shovelers feeding, the chances are that you won't see them dive or up-end (though they do do the latter at times); instead, you will see them feeding at the surface and this is where that peculiar beak comes in. Shovelers filter feed in a very similar manner to a number of other aquatic or semi-aquatic animals, such as flamingoes - and even some whales! 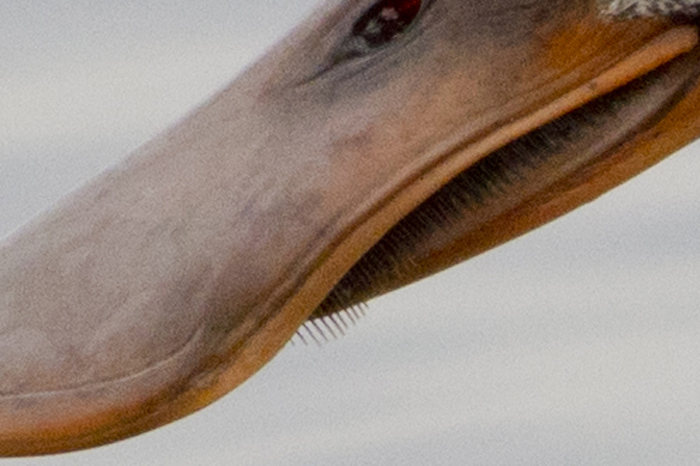 They achieve this by having a series of comb-like bristles - called lamellae - along the cutting edge of the upper mandible, together with a series of narrow grooves along the edges of the lower mandible. By using their tongue as a kind of pump, they are able to take water into the beak, then push it out through these bristles and grooves, the end result being that the water passes through and any morsels of food get trapped in the bill. An ingenious mechanism that clearly works well as it has evolved so many times in a bunch of unrelated organisms. 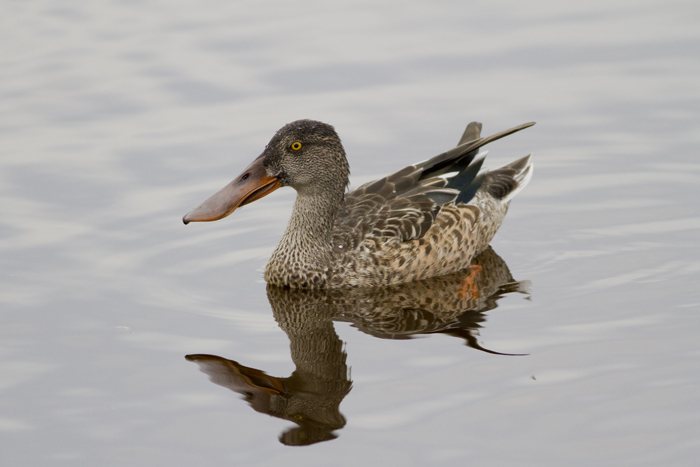 Check out the Northern Shovelers next time you visit a pond and check out how they are feeding. February continues its dreary way along as we strum our fingers and wait for March. However, there's certainly birds out there to be enjoyed. A quick look out of my office window even now reveals a young Red-shouldered Hawk lurking menacingly close to the Northwood feeders, while a Hermit Thrush performs all kinds of acrobatic contortions in its attempts to feed on the Greenbrier berries hanging all shiny and inviting. Out and about in the County, there is much to see; yesterday I spent some time out in the field for the first time in quite a while, as Megan, Richard Crossley and I took around another birder that was visiting the US from Britain - yes, my wife had to endure three Brits at once yesterday! 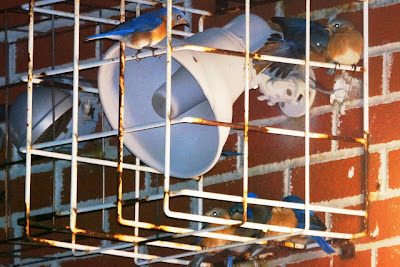 Our friend David Lindo markets himself as The Urban Birder (look him up on line!) and is making great inroads getting people from inner city areas into enjoying their local open spaces and wildlife. Cape May Point State Park still has a fine selection of birds and, though recent cold weather has pushed many of the ducks off to more southerly climes, some approachable Lesser Scaup and a lone Tundra Swan - sadly being bullied by the Mute Swans there (isn't it time we dealt with the ecological disaster of Mute Swans here?) - were nice to see. Two Snow Buntings were feeding along the dune edge. At Sunset Beach, our local pair of Bald Eagles looked fabulous perched on the concrete ship; the female was making fishing sorties along the tideline and successfully catching small fish to eat. Plenty of Long-tailed Ducks were in the bay too. Up at Stone Harbor Point, at least nine Western Sandpipers can be found among the nice Dunlin flock there and at least two Semipalmated Plovers are with the Sanderlings. We also witnessed a Razorbill fly north right along the tideline, then return south again shortly afterward. There seems to be a small movement of Razorbills taking place offshore today, with Tom Reed reporting at least eight off Avalon this morning and another scattering off Two Mile beach, including one flock of ten birds. From the Coastguard Unit, Chris Hajduk's reports include a Black-headed Gull on 11th, two Common Eiders on 13th and continuing Great Cormorants on the offshore pilings. Up to 12 Horned Larks are also wintering on grassy areas within the base. 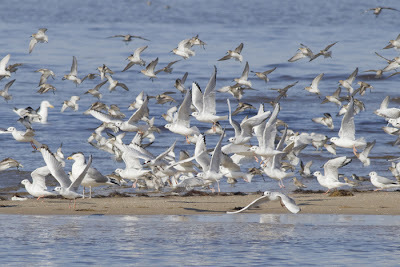 The best way to view birds here is either from the north end of Cape May at Poverty Beach (do not go beyond the Coastguard signs though) or from the jetty at Two Mile Beach, on the north side of Cold Spring Inlet. Last Sunday, Horned Larks were also showing well at Cape May Airport. The female of our local Bald Eagle pair showed great skill and grace in being able to hunt small fish in the shallows off Sunset Beach yesterday [photo by Mike Crewe]. When you can get great views of Bald Eagles like this, then Cape May is certainly the place to be in February [photo by Mike Crewe]. A small group of Cedar Waxwings has recently been working through the last of the privet berries in the circle gardens at Cape May Point [photo by Mike Crewe]. A Razorbill scuttling along the tideline at Stone Harbor Point yesterday [photo by Mike Crewe]. A party of up to 11 Red Crossbills (type 3) is still hanging out in the Japanese Black Pines in the dunes at Cape May Point. Keep an eye out for them, feeding acrobatically on the pine nuts. This odd-looking bird still wears the streaks of juvenile plumage but appears to be getting a few red feathers coming through now, so it looks as though it's a young male [photo by Mike Crewe]. Buffleheads are common wintering birds in South Jersey, but still make a good subject for photography on a sunny day [photo by Mike Crewe]. 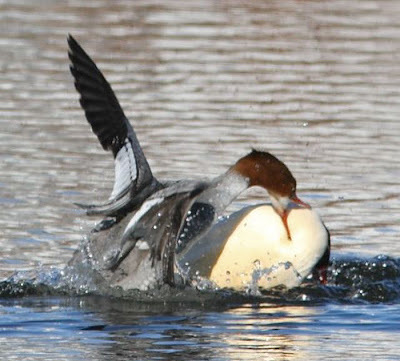 While on the subject of ducks, it looks like the Common Mergansers have been getting a bit feisty with each other on Lake Champlain recently [photo by Beth Polvino]. 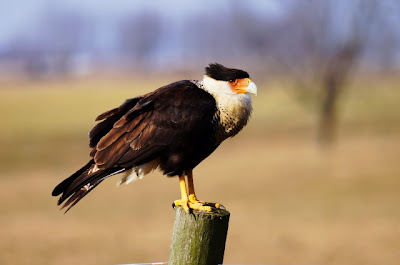 The New Jersey caracara conundrum continues; on February 6th, Sue Bennett Canale contacted me to say that she had seen a Crested Caracara that day, on a roadside pole in Galloway Township. Now, whether this is the bird that was at Cape May not so long back, or the bird that had been at New Gretna - or whether these were all one and the same bird - and whether these were all the same, different or otherwise from the Salem County bird (are you still following this?! ), is anyone's guess. Whatever the facts may turn out to be, suffice to say that a Crested Caracara continues to be reported from Atlantic County and was still present to Saturday 9th at least. Many thanks for all those who emailed me with their sightings, and apologies for not having time to reply individually to all. During this period, the bird has been seen most consistently right at the intersection of S. Odessa Ave and W. Duerer St., usually sitting on roadside poles. This intersection is just north of the intersection between Rt 30 (White Horse Pike) and 575 (S. Pomona Road). With just a small-handful of tunnel-visioned folks giving birdwatchers a bad name by trespassing at the recent Northern Lapwing spot in New Egypt, I feel duty-bound to add that this bird is adjacent to active farmland, and we respectfully ask any visiting birdwatchers to self-police themselves - for the sake of the reputation of our hobby. Crested Caracara in Galloway Township, Atlantic County, on February 9th [photo by Lisa Ryan]. Sounds like everyone had a great time at the Cumberland County Winter Eagle festival yesterday, despite a pretty keen wind. 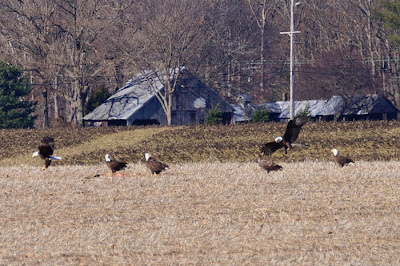 Though owls were in short supply this year, a good number of other birds put on a great show and there was certainly enough Bald Eagles to go round. In other news, the immature male King Eider continues at Cape May Point, as do Orange-crowned and Nashville Warblers in the state park, Red Crossbills and the Eurasian Collared Doves at the point and a Tricolored Heron, which has been seen intermittently on Ocean Drive near Two-mile Landing. At Cox Hall Creek WMA/Lake Champlain, an adult male Common Merganser joined the two immature birds there just for the day on Saturday, with the two immatures continuing today. A nice flock of Rusty Blackbirds is wintering there too, as well as a great selection of sparrows and other birds. Lunchtime today, I did a quick tour round of some duck spots, mainly because February is one of the most interesting months for ducks. Though the surface-feeders have often been thinned out locally by cold weather, the diving ducks can be present in good numbers still and it is often during these cold spells that odd ones turn up on smaller ponds and lakes, allowing closer than usual views. While scanning through some mixed flocks, I was also reminded that many first-winter diving ducks are in the middle of their often lengthy and protracted molt, which sees the males very slowly change from generally dull, female-type plumages into their more gaudy, adult-type garb. While this molt makes them interesting to people with a one-track mind like me, it can also be the one of the reasons why they can appear so tricky to people still trying to learn how to tell them apart. Compare our bird here with the photo in our post of December 12th 2012 and you will see that the white feathers of adulthood are very slowly increasing. Here, the bird has extra white now on the face, all of the front of the neck and throat, and also toward the back of the body. The bill seems just a fraction brighter too [photo by Mike Crewe]. So you could be forgiven for struggling to get to grips with this bird; the secret is to look at pictures of juvenile and adult birds and try to imagine what a bird part way between the two might look like. Do this for all similar species and you may well resolve your problem; in the case of eiders, adult male Steller's and Spectacled Eiders are not white on the chest, so they're ruled out, while male Common Eiders are white (not black) on the back and there is no sign of any white coming through on the back of our bird - the fresh-looking feathers on our bird are jet black and contrast with the brownish feathers of the wings. Don't forget other features too though, and with ducks that almost always means checking the bill for shape and color. If you can zoom in close enough (*see below) to these two birds, you will see that they show not just a white chin, but also a small white patch of feathers at the base of the bill, separated from the chin patch by a dark bar. This ages them as first-winter birds. So, now that we know about the protracted molt, we can start to look for other clues. The right hand bird clearly has some very pale inner secondaries and this immediately tells us that it is a male. The left hand bird has the same face pattern (though difficult to see here), but the wing look darker. I would say that this second bird, from this view, could be either a male or a female, though there's a strong possibility that these two are already paired up so it may well be a female [photo by Mike Crewe]. When it's cold and you're looking for some thought-provoking birding from the comfort of your car, give your local diving ducks a good going over and see what you can come up with. January may be the middle of winter, but it is always a busy time for birdwatchers, since it marks the exciting start to a new year list! The information highways are awash for a few weeks as everyone catches up on all the over-hangs from the previous year, and - let's be honest - it's the only time of the year that most of us take a sideways glance at a House Sparrow! Indeed, the amount of effort put in to eBirding by New Jersey birders in January 2012 was recently celebrated by Sam Galick who noted that over 7000 eBird lists had been submitted for the state by the end of January, presumably in no small part due to the remarkable run of rare birds that has graced the region this year so far. Such great rarities as Barnacle and Pink-footed Geese, Mew Gull, Northern Lapwing, Townsend's Warbler, Western Grebe, Pacific Loon, Pine Grosbeak, Western Tanager, Lazuli Bunting, Common and Thick-billed Murres, Rufous Hummingbird and those puzzling Crested Caracaras, have all been there for the chasing - and hopefully, folks have been logging their local birds too. By February though, winter is well and truly settled in and most people are starting to get into the winter doldrums; this certainly seems to have been the case this past week or so, with much less being reported (though several consecutive days of below freezing temperatures may have something to do with that! ), but there is still a scattering of goodies around South Jersey, as well as some great events looming on the horizon to get you out and about. At Cape May Point State Park, House Wren and the White-eyed Vireo seem still to be hanging on despite the cold weather - as do the Nashville Warbler and at least one Orange-crowned Warbler, but the Townsend's Warbler doesn't seem to have been reported for a while now. With ponds freezing and thawing, ducks are moving around a lot and Lake Lily, down at the point, remains a good bet, as the aerator filters keep up water movement and usually result in a few unfrozen patches that became crammed with birds - the mix can change daily, even hourly, at this tme of year and is always worthy of a check. 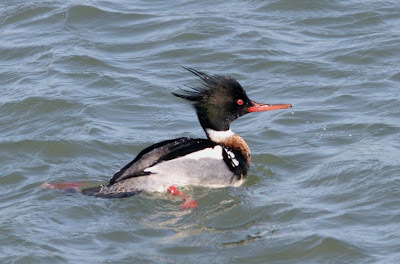 Up at Cox Hall Creek WMA, a good mix of ducks has recently included a Common Merganser. Of interest at Cox Hall Creek recently was a female Ring-necked Pheasant, reported by Will Kerling. This is a species that is not part of the established avifauna of the Cape May area and only persists for short periods after repeated releases for the purposes of shooting, so doesn't usually get a mention by me. However, I wasn't aware of any released in the Villas area so its presence is interesting (the species was released in the Tuckahoe/Corbin City area last fall). Two Lapland Longspurs were noted at the corner of Wetherall and Bayside Roads in Cumberland County on February 3rd, a Short-billed Dowitcher has been reported on a number of occasions at the shorebird roost at the south end of Brigantine Island (just north of Atlantic City and not to be confused with the main Brigantine NWR area that birders usually visit) and a young Golden Eagle is there for the finding at Corbin City Impoundments if you can make the walk in - this site still remains closed to vehicles after Hurricane Sandy. Finally, on February 3rd, a Brown Pelican was reported flying low over the coastguard ponds on Ocean Drive, just south of Wildwood Crest. So there are still birds to be found out there, but there's also some great events coming up. This coming Saturday, February 9th, sees the annual Cumberland County Winter Eagle Festival taking place, and it looks set to be an even more interesting day than usual. Why? Well we have some very high/low spring tides forecast, associated with the new moon and Cumberland County's coastal wetlands are always exciting at such times. Normally reclusive wetland birds such as rails and saltmarsh sparrows are often pushed up into more open areas along roadsides, while raptors may well be taking the opportunity to hunt for food. Do come along - the weather is forecast to be a little warmer than of late and - if it does get too cold for you - there's some great indoor events at the Mauricetown Fire Hall too. A little further into the month, Pete Dunne's 'Break into Birding' workshop is well subscribed and guaranteed to run, but there's still time to book your place. This event is a return to a very popular program we ran in the past and is a fabulous introductory course to all aspects of birding - the who, where, what, how, when and why of birding, all wrapped up in a fun weekend event. If you feel you have that early training nailed and want to put it into practice, February 16th also sees our annual Longtails in Love event. This is a great walk that takes in some wonderful winter waterfowl locations, but its main focus is the fabulous experience of watching - and listening to - the manic parties of courting Long-tailed Ducks along the barrier island inlets - and all timed as close to Valentine's Day as we can get. Be an old romantic and come and join us! The weather is certainly topsy turvy at the moment; after posting my recent piece on finding American Woodcock and Wilson's Snipe during freezing weather, we had 48 hours of thawing and it seemed that my advice was going to be far less than timely. However, the last 48 hours have seen a return to the big freeze as some fiercesome weather blew up from the south and eventually dumped a fresh batch of snow on us. This up and down situation seems to have caused most birds to hunker down and sit tight, so not much new seems to be happening in the bird world around Cape May right now - though Tom Reed had the foresight to check out Sunset Beach on the morning of January 31st and scored a Harlequin Duck and five Razorbills heading out of the bay. Of great interest, Chip Krilowicz reported a Caspian Tern at Jake's Landing on February 1st - a real vagrant at this time of year as this species generally winters down around the Gulf of Mexico. However, at least three sight reports have been submitted to eBird from North Carolina so this may well be yet another bird to be taking advantage of the generally mild winter we are having. Still, you could do a lot worse than come down to Cape May - we still have a great selection of waterfowl on offer, while feeder birds are pretty good right now (he says as he casts one eye over the White-breasted and Red-breasted Nuthatches, Fox Sparrows, Purple Finches and so much more at the Northwood Center feeders!). Right at the very time I was putting together my 'search image' post, Jeff Kiger was emailing me these great pictures of a Wilson's Snipe at Pennsville, Salem County. As Jeff told me, when you have a 500mm lens, you can still get great shots even from right across the other side of the road! If you can't get out because of the weather, a fully-furnished feeding station in your yard and a handy window can still give you hours of pleasure - and the chance of a surprise or two. Steve in Cape May Court House sent us this picture of a leucistic White-throated Sparrow in his yard recently. This bird has a lack of color pigment in some of its feathers - a genetic defect known as leucism, which may affect anything from all the feathers to just one or two. What is interesting with this bird is that, though most of the head is all white, the bright yellow patch remains in front of the eye. Click here for details of the Cumberland Co. Winter Eagle Festival, February 9th 2013.